When I first started my wedding photography business, Erin Lindsey Images, in 2009, I felt all alone and completely overwhelmed. I spent every spare moment trying to figure out the best way to run my business. How should I set up my pricing and packages? What's the best way to respond to an inquiry email? How do I conduct a consultation? How do I establish myself as a professional in the industry and market myself to get new clients? I was left to figure everything out on my own resulting in hours, weeks, even years spent on trial and error. I had to go back to the drawing board over and over again... often times, after spending a lot of time and money. Over the years, I've coached and heard from so many new and aspiring wedding photographers asking the same questions I had when I started. Even simple questions that I know I wasted a lot of time figuring out on my own. It made me realize that these questions and the desire for practical direction is real. It was real for me back in 2009 and it's still real for new wedding photographers today. I have a heart for new and aspiring photographers who are navigating the sometimes overwhelming and confusing wedding photography industry and I want them to have the tools to confidently start and grow their wedding photography business. I am so thrilled to now be able to walk alongside them through my new coaching program! This is a program for any new or aspiring wedding photographers (regardless of where you live) who need some guidance on how to build and grow a successful, professional, client-focused, servant-hearted wedding photography business. It's geared towards wedding photographers who have yet to launch their business and new wedding photographers who are in their first year or so of photographing weddings. In this program, I'm walking you through the processes I have personally used to grow my wedding photography business from being an inexperienced hobbyist to bringing in 6 figures within the first few years of starting my business. I believe that running a successful wedding photography business is more than just taking great photos... it's about serving your clients well and being professional and efficient in the process. In the program, we'll start with the basics for beginners who need guidance on what to do to set their business up, then we'll dive in to talk about everything from pricing and packages to emailing, social media and marketing tools, and how to handle client consultations. We'll discuss how you can give your clients an excellent experience by how you prepare and engage with them at the engagement session and on the wedding day. We finish our final week talking about the systems we use to photograph the actual wedding day efficiently and professionally and in a way that serves our clients well, creating raving fans who are eager to refer their friends to us! I believe that as we work through this program together, you're going to gain confidence and get easy to follow direction for processes you can use right now to start and/or grow your wedding photography business. The coaching program is delivered in video slide form via Dropbox. You'll receive all the video lessons when you sign up, and even though the program is split up into "5 weeks" worth of lessons, you can watch/listen and learn at your own pace wherever and whenever you want! Whether you live in Alabama or Hawaii or whether you can start watching immediately or not until 5 months from now, it doesn't matter! Keep scrolling to learn about what we'll be talking about each week as well as some extra bonuses you'll receive when you sign up! We'll talk about the basics for setting your business up, figuring out who your ideal client is, setting goals for your business, tracking mileage and expenses, and more! I'll give you easy ways you can market your business through working with other vendors and leveraging social media and blogging to help get your business on the map and draw in your ideal clients. We'll talk about what to do when you get that new inquiry in your inbox, how to conduct a consultation with confidence, and how to professionally bring your new client on board when they decide to book with you. We're going to talk about how to be efficient and serve your clients through how you prepare them for their engagement session, how you interact with them at the engagement session, and how to continue to serve your clients by how you share the images afterwards. We'll talk about how to engage with your clients and give them an organized, stress-free experience in those last few months before the wedding. We talk about how we prepare for the wedding day by creating a timeline, family photo list, and more. I'll walk you through how we photograph a wedding day... how to be professional and efficient throughout the day with a focus on serving your clients and their families well. We'll finish our final week talking about our post-wedding day process. Throughout this program, you'll see homework prompts to help you get the most out of the program. Completing the homework is encouraged, though not required! And you don't have to share it with me or anyone else, unless you want to. So don't let the homework intimidate you! You can work through the program and the homework at your own pace... even if it takes you longer than 5 weeks. You will be added to an exclusive community of coaching students in a private Facebook group! It's a place where everyone can encourage and support each other, ask questions, and I will be interacting with the group and doing Facebook Live Q&A's every so often so that we can talk about each lesson in more depth. I will be checking in periodically to continue to coach and support you as you grow your business even after you finish working trough the program. 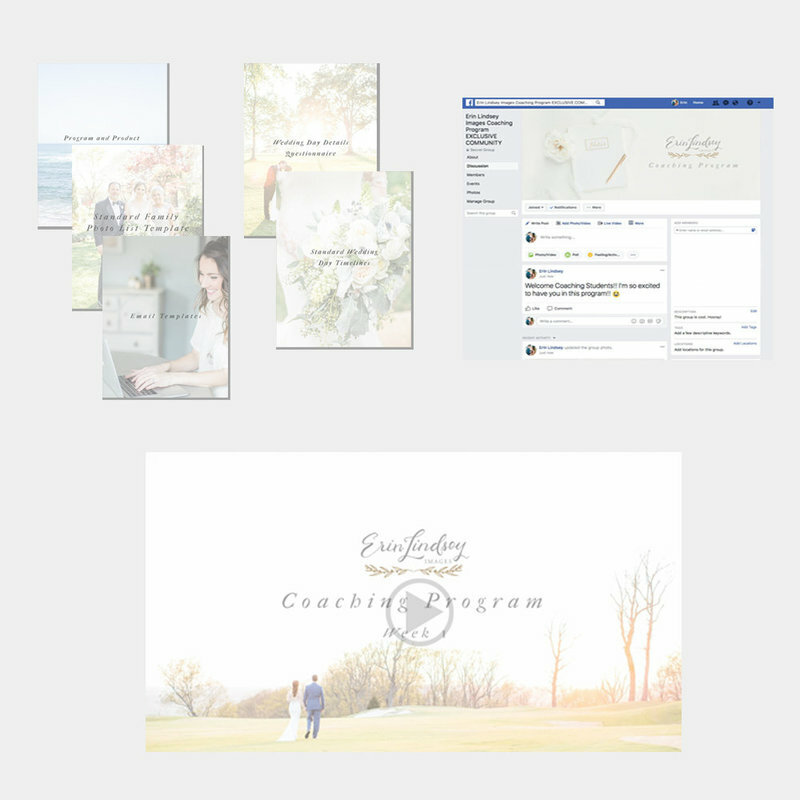 If you're ready to gain confidence, serve your clients, and grow your new wedding photography business once and for all, I invite you to join me and other new wedding photographers in my new coaching program! I hope to have the honor of walking alongside you and encouraging you through this process! If you have additional questions about the Coaching Program, you can email me directly at Erin@ErinLindseyImages.com! Facebook Live Q&A's with Erin! "I really want to say THANK YOU from the bottom of my heart. This coaching course has really helped me identify what I need to work on and has given me the tools to feel confident in the service I’m offering. I loved how you went through each stage (consultation, engagement shoot, actual wedding day, etc) because it gave me just a clear picture of the systems I need to put in place for each phase! Most coaching courses out there don’t offer what you offer for fear of giving away their “secret recipe for success” but I’m so thankful for your heart and desire to serve. I know it will take some time but I’m so excited to really put in the work to serve my future clients well. Thank you for virtually holding my hand and walking me through this!" - Sarah W.
Join the Coaching Program Today!